Additional Rail Services via the Channel Tunnel. We love speed. DB Schenker Rail (UK) introduced additional freight services on High Speed 1 from January 13, carrying automotive components and refrigerated containers of perishable foodstuffs from Spain to London via the Channel Tunnel. DB Schenker Rail (UK) has a track access contract with HS1 for an initial six months, and both parties intend this to continue. DB Schenker Rail (UK) already operates twice-weekly return services to and from Poland. ‘This is a big step up for freight on HS1, and is an area in which we continue to grow’, said HS1 Ltd Chief Executive Nicola Shaw. 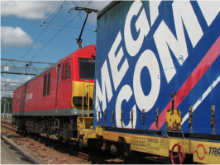 The contract ‘demonstrates the value of the high speed network in the UK’, with the ability to provide a seamless service to the shippers using standard European wagons which are too large for the rest of the UK national network.